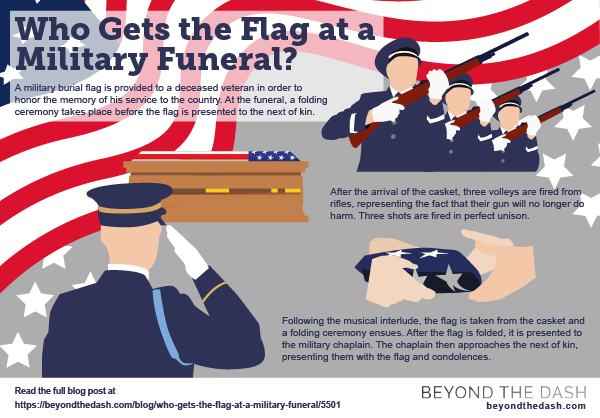 Who Gets the Flag at a Military Funeral? A military burial flag is a gift to the family of the deceased veteran on behalf of the Armed Forces and President of the United States. It is a symbol of the honor earned, and sacrifice made, in battle while serving America. Members of the military that have died in the line of duty, or in Selected Reserves, are eligible for a military funeral. Those veterans who were honorably discharged are also given the honor of a military funeral. Flags have long been a traditional part of military funerals. The tradition of draping the casket of the deceased veteran and presenting it to the next of kin dates back to the Napoleonic Wars. Soldiers who perished in battle were draped in the national flag. This tradition evolved over time to extend to the intricate folding ceremony that takes place in military funerals to this day. Around the world, flags are a meaningful part of the burial ceremonies of honorably discharged or fallen veterans. In the United States, when the flag is folded, the stars point upward to remind the people of the national motto, "In God We Trust." If a life is lost in battle, military members are responsible for delivering the sad news. Designated notifiers visit the veteran's next of kin and offer the United States flag, along with the following words: "Your son fought bravely, please accept this on the behalf of the president of United States." The military and family will jointly arrange for the funeral service, during which the military flag will be presented to the next of kin. The flag itself is made of cotton and is not suitable for outdoor display. It is a decorative, symbolic token of services, to be cherished and preserved. The official, government-specified dimensions of the flag are 5'x9'.6". Do all veterans receive a flag? 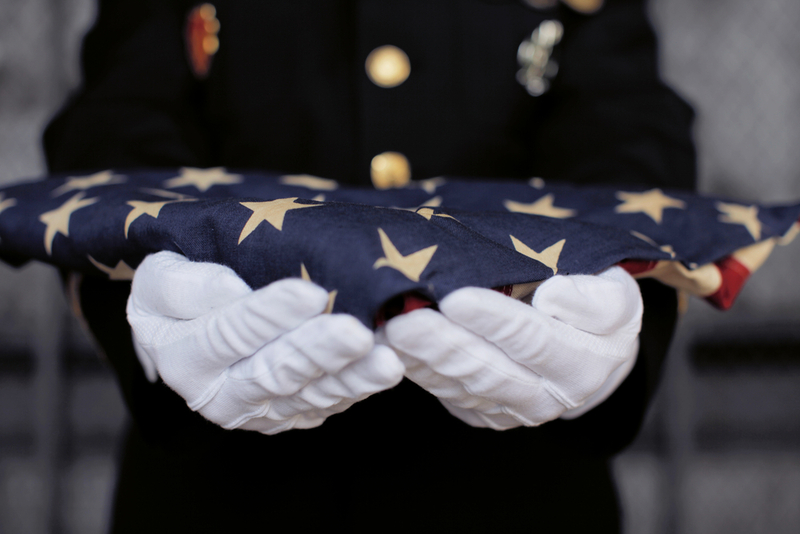 According to the United States Department of Veteran Affairs, a military burial flag is provided to a deceased veteran in order to honor the memory of his service to the country. Below is the stated United States Department of Veterans Affairs criteria for receiving a military burial flag. Certain former members of the Selected Reserves"
Who is presented with the military burial flag? At the funeral, the flag is presented to the deceased's next of kin. The next of kin is the person who is most closely related to the veteran. After receiving the flag, it is tradition among the family members to preserve for display in the house, usually in a frame. Some families donate or supply their flags when for national veteran events, such as Memorial Day. How is the next of kin selected? Active duty members appoint their next of kin prior to deployment. There is usually no dispute of who the flag recipient should be. 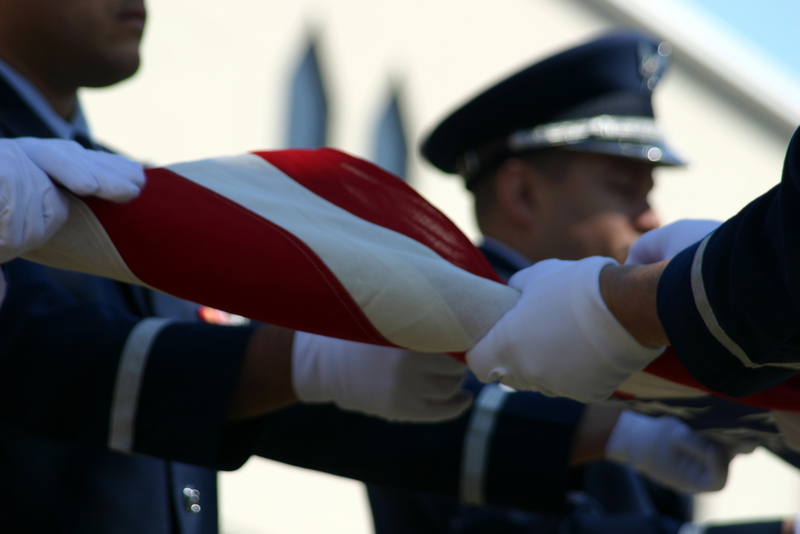 However, in certain circumstances, such as the death of the next of kin prior to the death of the military member, the person closest to the deceased will receive the flag. If none of these relatives are available to receive the flag, any other relative or close friend can receive the flag in accordance with the deceased's domicile certificate. The military burial flag ceremony symbolizes the honor bestowed upon the dead, as well as the surviving family. Both the deceased veteran and the family have made a sacrifice for their country, and the ceremony honors that sacrifice. The casket of the deceased is always covered with the military burial flag, with the stars of the flag covering the left shoulder side of the casket. The casket is carried by horse-drawn caisson, for certain members of certain ranks. After the arrival of the casket, three volleys are fired from rifles, representing the fact that their gun will no longer do harm. Three shots are fired in perfect unison. Playing the Taps is another tradition. The Taps were originally composed to signal "lights out." The Taps is a bugle call, typically played at dusk. Following the musical interlude, the flag is taken from the casket and a folding ceremony ensues. The 12 folds of the military burial flag each have their own significant meaning. After the flag is folded, it is presented to the military chaplain. The chaplain then approaches the next of kin, presenting them with the flag and condolences. "As a representative of the United States service branch, it is my high privilege to present to you this flag. Let it be a symbol of the appreciation this nation feels for the distinguished service rendered to our country, and to our flag by your loved one." Presenting the military burial flag is one of the most sacred rituals on the day of a military funeral for the deceased veteran, as well as for the family. The flag is a lasting symbol of their sacrifice that will stay in the family forever. No matter how long it has been, it's never too late to create a digital memorial in honor of a fallen hero. If you are thinking of a loved one who deserves a written tribute honoring their life and accomplishments, consider creating a memorial story on Beyond the Dash. It's free to publish online, and can be shared with family and friends for years to come.